There is one thing that annoys me about babies. I can get over the spew and the crying, and I can genuinely say that a dirty nappy doesn't bother me at all. The thing that drives me mental is the ability for a small child to make everyone around it speak improperly. Sing song words and speech impediments along the lines of Elmer Fudd are apparently de rigour for talking to infants. One such baby talker is my Father-in-Law. He will put on a cutesy voice, mix up his letters and even lisp when he talks to my daughter. Not just sometimes either. Every. Single. Time. "Naww wook at your cute widdle dwess! You're so pwetty!" I physically tense when he speaks to her that way. It grates my nerves. I'm sure when she's older my daughter will think her grandfather actually has a lisp. Recently when getting her dressed to go see her grandparents I thought I would throw a spanner in the works and not put her in a "cute widdle dwess", just to avoid hearing him say it. I dressed her in some gorgeous yellow pants and a knitted jacket then made my way to the in-laws' house, feeling a little bit clever that I was about to outsmart him. And then he did it. "Naww wook at your widdle stwipey twousers! You're so pwetty!" The final He Did What!? Wednesday was provided for use by The Duchess of Cambridge(Street), a good friend of mine. She grew up in the same town as Map Guy then married a bloke he went to uni with. We are the WAGS. She is on maternity leave from her job as a hospital pharmacist to care for her very gorgeous one year old Princess with the most adorable giggle you've ever heard. 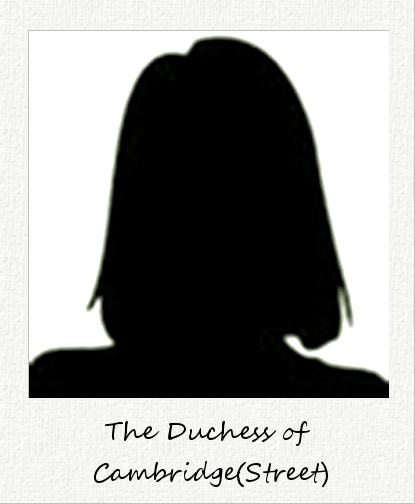 The Duchess is so uber smart that you'll want her on your team at a quiz night to answer all the science-y questions. She is a cat person but I have forgiven her for that. Thank you for this wednesday giggle!